Cohabitation brings many perks but one of my utmost favorites is the joy of cooking together and for one another. But it also means shelving the roster of old standards you became used to as a single person—you know those dishes you pull out of your arse at nine p.m. when looking at the clock after an evening of binge-watching Netflix with half a bottle of red wine and lukewarm kale chips and realize you need to eat something of substance. One of my old stand-bys has always been the fried egg sandwich. Bonafide egg whores like me will agree that nothing quite fills in when you need something quick, easy, nutritious and slightly seedy than a buttery egg between two luscious slices of bread with whatever adornment you desire. When my daughter was younger, she would liltingly ask for an egg sandwich every morning before school. Her order was persnickety and always the same: sunny side up on one piece of toasted, buttered French bread with a tiny creek of runny yolk and lots of salt. Then another piece of toast to shred and dip into the sunshine yellow until the creek ran dry at which time she would gobble down the rest. For me, being of a more adventurous palate, I have created and adored many a variety of the classic egg sandwich. So when I found myself alone at home for dinnertime recently, I decided to revisit and elevate my old friend with a naughty multicultural crossbreed that did the trick. 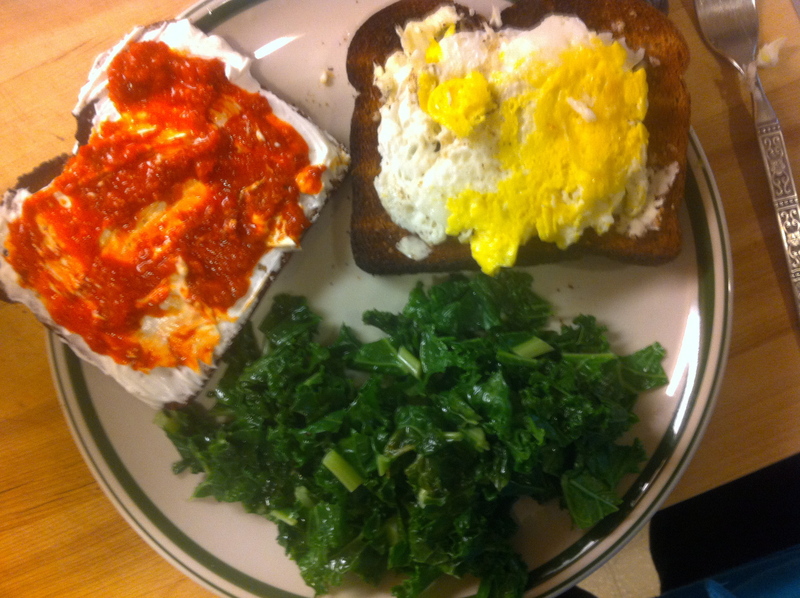 I fried the egg in luxurious French butter like an indulgent Marie Antoinette and then plopped it onto a slice of hearty multigrain toast whose better half was already spread with thick Armenian labne (a tangy, cultured kefir cream cheese) and Ajvar (an addictive roasted red pepper vegetable spread). The result was a fluffy, warm and bright rendition that went splendidly well with a healthy side of blanched, olive oil tossed kale from the garden. Dinner for one can still be quite fun! 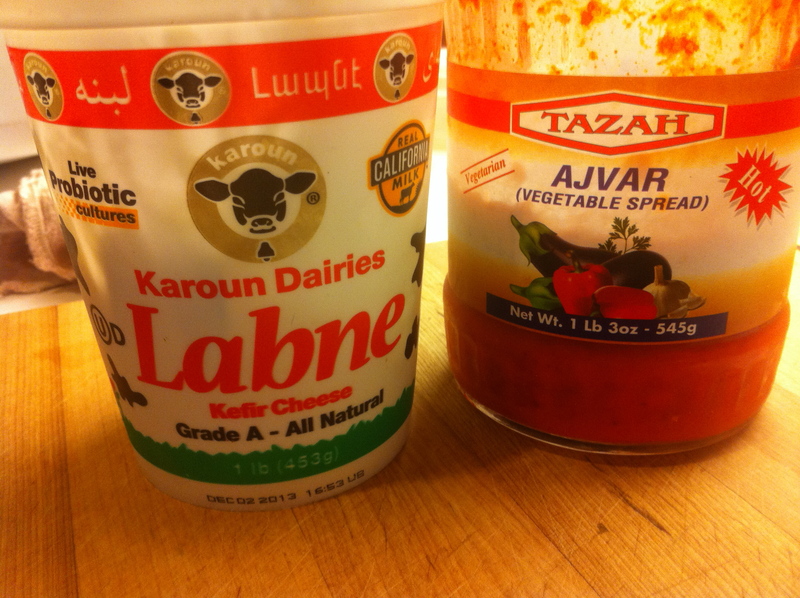 This entry was posted in Through The Stomach and tagged armenian labne, classic sandwiches, cultured foods, egg sandwich, egg whore, Kimberly Nichols, through the stomach, Unorthodox Foodie by unorthodoxfoodie. Bookmark the permalink.